The Road Safety Authority is warning road users to be extra cautious. 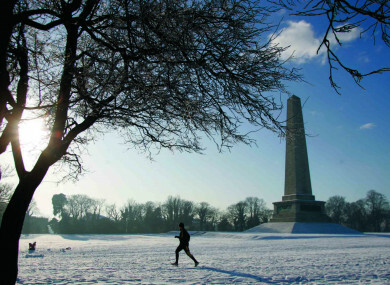 Dublin's Phoenix Park under a blanket of snow in 2010. MET ÉIREANN HAS issued a status yellow snow and ice warning for the country with temperatures set to dip to below freezing. Temperatures could get as low as -4 degrees celsius tonight with frost setting in early and becoming “severe as the night progresses”. The weather warnings have been issued for entire country but Met Éireann has said that snow showers are most likely in Ulster and Connacht. The low temperature warning kicks in from 11pm tonight and lasts until tomorrow morning but Met Éireann is warning about the possibility of snow and ice into the weekend. Following warnings that roads could become icy overnight, the Road Safety Authority is urging motorists to take extra care with the potential for black ice also a worry. Black ice can be difficult to spot but it can look like a puddle on the road or give the appearance of a “glossy” pavement. Among the advice the RSA is offering road users is use dipped headlights during times of low visibility and to carry a screen scraper and de-icer in the car. Email “Snow and ice warning for Ireland as temperatures set to plunge to -4 degrees”. Feedback on “Snow and ice warning for Ireland as temperatures set to plunge to -4 degrees”.